Every parent knows the feeling. You've been asleep for a while. Everything is quiet and peaceful. You're just starting to get into the soft, loose part of the night's sleep, when suddenly you wake to a strange noise in the next room. What was that? Then, in the pitch darkness of midnight, you hear it again, a loud rattling bark that could only be coming from the baby. This time, it's followed by a strangled cry and more of that strange sound like a sea lion. Croup! Otherwise known as laryngotracheobronchitis. (When you've got three parts of the airway involved in an "itis," you know it's not a good thing. )Strangely, the child was perfectly well when you put her to bed a few hours ago! Now, she's crying, terrified and red-faced with fever. This is the type of croup that calls for homeopathic Aconitum napellus. Homeopaths have a triad of remedies that we think of first for croup. In a case like this one that comes on suddenly after midnight with fear and high fever, Aconite is where we start. The next remedies in the group are Spongia tosta and Hepar sulphuris calcareum (or Hep sulph). All three of these remedies are included in most home remedy kits. An Aconite sort of croup is most likely to come on after a child has been exposed to cold dry weather or wind, and the time of day when Aconite complaints tend to get worse is after midnight. The onset of any illness needing Aconite will be very rapid and intense. Aconite fevers tend to be very high. Especially in kids, Aconite is great for those fevers that seem to start at 104 degrees. As you might imagine, such violent symptoms are quite frightening, and someone who needs Aconite will often feel as if they are on death's door. Homeopathic Aconite is made from one of the most poisonous plants known. 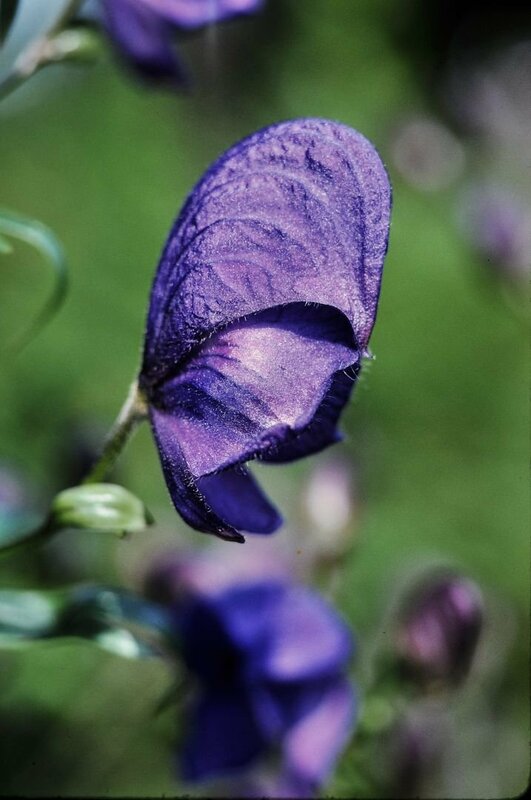 Its common name is Monkshood or Wolf's Bane. (Harry Potter fans will recognize these names from Professor's Snape's first encounter with Harry.) It is said that one bite of the flower is toxic enough to kill a cow. It causes restlessness and fear followed by paralysis of the motor and sensory nerves. Many other symptoms that we associate with fear may also be present in an Aconite case, among them tingling and crawling, a feeling of heat and a pressing pain in the heart. The cough may be worse lying on the sides and better from lying on the back. The fever will improve when the patient starts to sweat. Of course, the homeopathic dose, starting at one part in a trillion (6C), is able to improve these symptoms when they arise from illness. Aconite is often prescribed in the higher potencies, 30C and above. Enough of what Homeopathy isn't. What is it?